1. Navigate to the Assignments area of your course. 2. Create a new assignment. 3. Name the assignment, and scroll down to Submission Type. 4. Under Submission Type, select External Tool. 5. 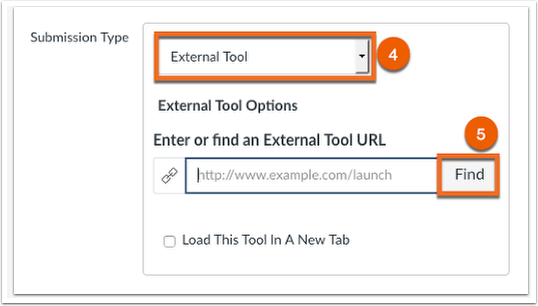 Click Find on the External Tool URL. 6. Select VoiceThread from the list. 7. Click Select to save your changes. 8. Save or Save and Publish your Assignment. 9. Click back into the assignment you just created. 10. From here, choose Assignment Builder. Assignment Builder will link to three different options which will be further described below. 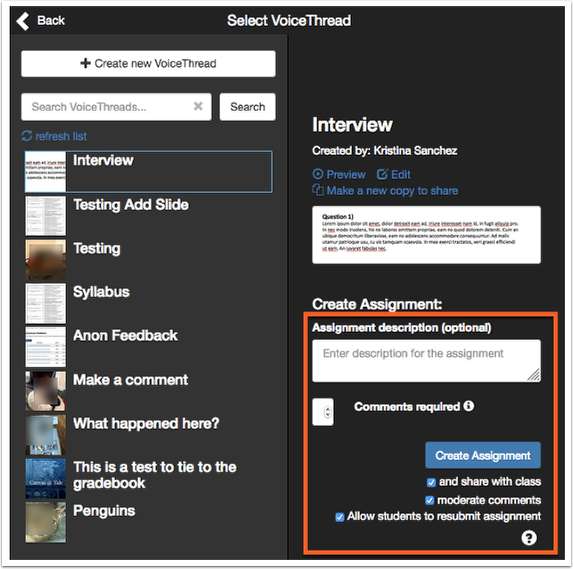 Selecting this option will allow students to create and submit a VoiceThread of their own. You will be able to enter an assignment description from here, and create the assignment. Selecting this option will require students to comment on a VoiceThread you have created. Private comments will not count toward the total number of comments for assignments. After selecting this option you will be prompted to select a VoiceThread from your existing VoiceThreads , or you will be able to create a new VoiceThread  and select the comment requirements. 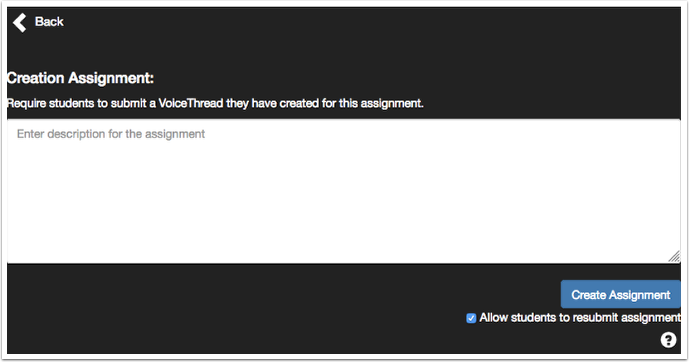 Once you select the VoiceThread, you will be able to set assignment parameters. This includes entering a description, how many comments are required for the assignment, and if you would like the assignment comments to be moderated. 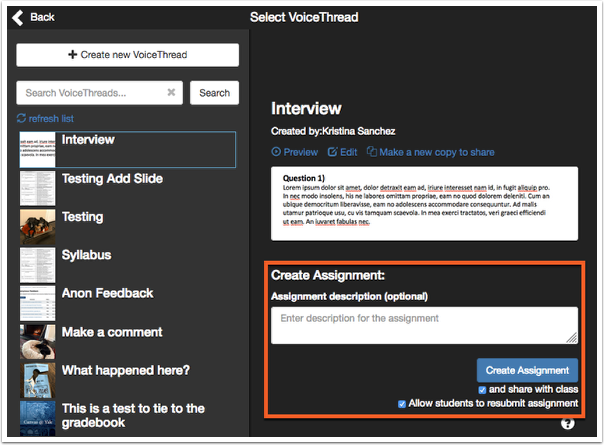 Choose Create Assignment, and the VoiceThread will then be linked the the assignment in Canvas. Require students to watch an entire VoiceThread from start to finish. 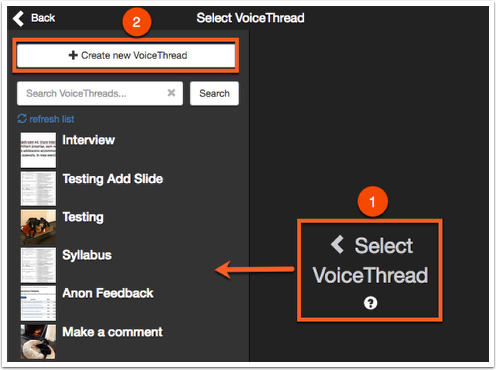 After selecting this option you will be prompted to select a VoiceThread from your existing VoiceThreads , or you will be able to create a new VoiceThread  and select the assignment requirements. Once you select the VoiceThread, you will be able to set assignment parameters. This includes entering a description and allowing students to resubmit the assignment. 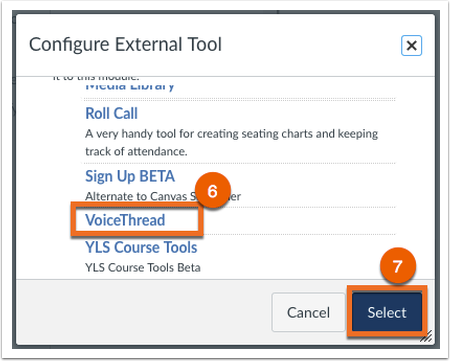 For more options to integrate VoiceThread into Canvas, visit our help guide found here. Detailed instructions regarding how to use VoiceThread within your course can be found on the vendor's website, located here. Join VoiceThread for free workshops! If you are new to VoiceThread or want new ideas, VoiceThread hosts interactive and hands-on workshops. Click here to register. You can also watch previously recorded workshops presented by VoiceThread by clicking here. Follow the VoiceThread YouTube Channel. Read more about VoiceThread on their blog page.